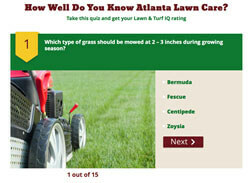 Arbor-Nomics® Turf Inc., one of the leading providers of lawn, ornamental tree and shrub care for Metro Atlanta and beyond, has just launched a new, interactive quiz on its website. By answering 15 multiple-choice questions, users get to test their own Atlanta lawn care IQ and get a glimpse of the knowledgeable care Arbor-Nomics delivers to its customers. The quick quiz covers issues that affect the health and appearance of Atlanta-area landscapes, such as the best mowing height for different grasses, common pests, and watering. Each user gets feedback on how well he or she did. Anyone who selects only a few right answers is offered a free lawn-care consultation. Those who do exceptionally well are invited to explore career opportunities with the company. The company, whose tagline is, “More than treatments, we apply knowledge,” invests in training, education, and certification for its field techs, who are known as Certified Landscape Specialists (CLSs). Along with delivering scheduled treatments, each CLS provides customers with tips and recommendations on proper care and information about signs to watch for that are tailored to each customer’s yard. Knowledgeably answering questions customers have about their properties is also a normal part of the service CLSs deliver.